This is the 38th year for the Miamisburg (Ohio) Turkey Trot race where 10,000+ brave (some say not-so-nice other things) men and women will make room for an extra helping of turkey and dressing by running and/or walking 5 miles. 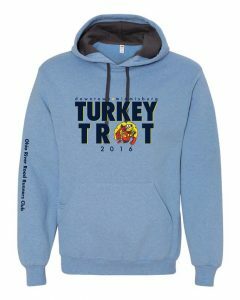 This year we receive this official 2016 Race Hoodie, a nice upgrade from the usual sweatshirt. I began running this race back when only a couple hundred serious runners participated and watched it grow over the years into an overflowing mass of folks. It's still fun, but except for the few who start at the front of the pack, it's more a game of dodge-em than running.